All the contenders who are looking for GWSSB Recruitment 2018-2019 Notification can take a brief eye on this article. The authority of Gujarat Water Supply And Sewerage Board has recently released 105 Additional Assistant Engineer Vacancies. There are 83 posts for Additional Assistant Engineer (Civil) Posts, and there are 22 posts for Additional Assistant Engineer (Mechanical) Vacancies. Moreover, this is the exact time to apply for GWSSB Recruitment 2018-2019 Notification. Therefore, before applying contenders should know the precise details regarding GWSSB Additional Assistant Engineer Recruitment 2018-2019 Notification. Moreover, all the job seekers need to grab the necessary details regarding such as the Educational Qualification, Age Details, Application Fee, Pay scale, Starting and Closing dates of the application, Age Relaxation, Selection Procedure, Official link Notification, etc. from this article. To help the contenders we tried our level best and collected the mandatory details regarding GWSSB Recruitment 2018-2019 Notification. Moreover, all the aspirants need to grab the necessary details regarding GWSSB Recruitment 2018-2019 Notification. The main point is to know the starting and closing details of the application. Therefore, the starting date of the application is 23rd March 2018, and the closing date of the application is 11th April 2018. 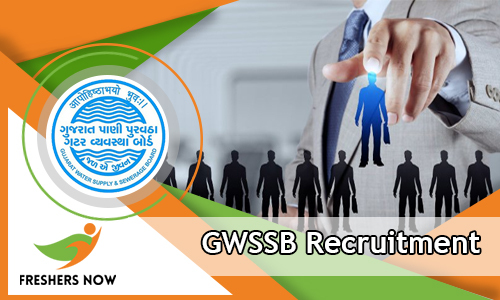 Moreover, there a number of job seekers in a race to apply for GWSSB Recruitment 2018-2019 Notification. The authority of GWSSB is intimating to apply on or before the closing date of the application. All the candidates need to apply through Online Mode before the deadline of the closing date. Furthermore, aspirants are asking to provide the mandatory details regarding GWSSB Additional Assistant Engineer Recruitment 2018-2019 Notification. Candidates must check their eligibility criteria and should apply for the GWSSB Recruitment 2018-2019 Notification. Moreover, follow this article for latest updates. Moreover, candidates verify the above table and check the necessary details regarding GWSSB Recruitment 2018-2019 Notification. Aspirants go through the table and check the precise information such as Name Of the Organization, Name of the posts, Starting and closing date of the application, Mode of Application, Official website. The authority of Gujarat Water Supply And Sewerage Board has released 105 Additional Assistant Engineer Vacancies. Moreover, this is the great opportunity for the job applicants who are waiting for the GWSSB Recruitment 2018-2019 Notification. Furthermore, stick to this article for more latest updates. In the below sections we have bundled a lot of information regarding GWSSB Recruitment 2018-2019 Notification. Well coming to the necessary details all the aspirants must grab the details before applying GWSSB Recruitment 2018-2019 Notification. Coming to the precise details aspirants should mainly know the Educational Qualification. The aspirants should possess the Degree in Engineering from the recognized university. The other point is to check the Age details. The Maximum age should not exceed 33 Years. The Age Relaxation will be based on the categories. The other aspect is to verify the Application Fee details. For General candidates, the Application Fee is Rs: 400/-, and for Reserved Candidates, the Application Fee is Rs: 20/-. Moreover, all the contenders refer all the mentioned details carefully. Therefore for more queries visit the official web portal of GWSSB at ojas.gujarat.gov.in. Hence, interested applicants scroll down to know the remaining data. Furthermore, the contenders should apparently know about the Selection Procedure. The Selection Procedure is based on the two rounds. They are Written test, Interview. Moreover, aspirants should get the minimum qualifying marks in the Written Exam. So, to get the maximum marks, we also furnish the Syllabus and Previous Papers in the upcoming article. The authority will pay an excellent pay band to the candidates selected in all the rounds. The officials of GWSSB will pay a pay scale of Rs: 38090/- for the posts of Additional Assistant Engineer(Civil & Mechanical). Therefore, follow the current article and check the remaining data regarding GWSSB Recruitment 2018-2019 Notification. Hence scroll down and find the necessary details. Moreover, to know the latest updates bookmark our web portal so that you can receive the notifications. The candidates should possess the Degree in Engineering from the recognized university. The maximum age should not exceed 33 Years. The Age Relaxation is given based on the categories. The PayScale for the candidates who got selected in all the rounds is Rs: 38090/- for Additional Assistant Engineer (Civil & Mechanical). Moreover, a considerable number of aspirants are asking to furnish the stepwise procedure for GWSSB Recruitment 2018-2019 Notification. For the sake of candidates, we are bundling the stepwise process for GWSSB Recruitment 2018-2019 Notification. To know the following steps refer the below sections. Furthermore, download the Application Form. Moreover, all the candidates by following the above steps can apply for the GWSSB Recruitment 2018-2019 Notification. Candidates don’t forget to apply before the closing date through Online Mode. Moreover, all the applicants got enough information regarding GWSSB Recruitment 2018-2019 Notification. Furthermore, if you have any doubts then leave a message in the comment section. We will verify and clarify your doubts. To know the latest stuff aspirants keep browsing Freshersnow.com regularly.